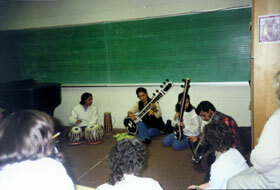 Giving a seminar with Om Shringara Nepal at the University of North Carolina (Asheville), during the group's second U.S. tour. Achyut Ram Bhandari holds a permanent teaching position at Nepal's Tribhuvan University. He has also been teaching privately for almost two decades. 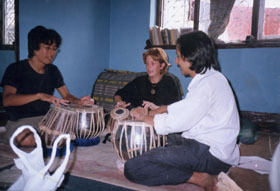 In addition to his Nepali students, he has given lessons to students visiting from the U.S., Japan, Italy, Israel, Spain, Canada, the U.K., Poland, Russia, Holland, Denmark, Portugal, and Germany, to name only a few. He has also hosted foreign students in his home for extended study. (Though there is currently no way for long-term foreign students to receive student visas for studying music, Mr. Bhandari is currently working to establish a recognized program of study for foreign students at Tribhuvan University; with luck, the plan will be in place by 2004.) 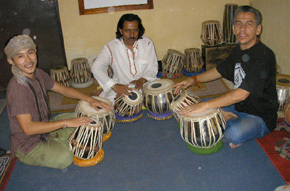 Om Shringara Nepal can also give seminars on Nepali folk and Indian classical music. 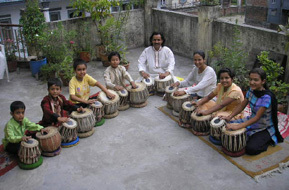 Short-term students need not purchase a tabla for lessons, as Mr. Bhandari has many tablas for student use in his home. 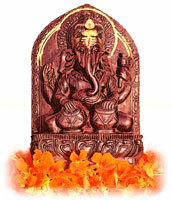 However, if desired, Mr. Bhandari can also provide the highest-quality Varanasi tablas and a variety of cases at very reasonable prices. 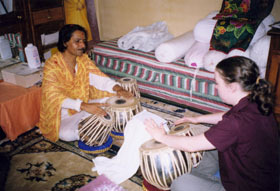 He has also has a large collection of otherwise unavailable recordings of tabla performances that he can share with his students. If you would like to contact Mr. Bhandari to arrange for lessons, please see his contact information. Below are a few images of Mr. Bhandari with his students. Mr. Bhandari teaching privately from his home in Kathmandu. Mr. Bhandari with his American student Azalia Birch. Mr. Bhandari with a few of his young Nepali students.